At OMDI, we can come to your assistance if you need help with septic tank installation in Leeds. We have been installing septic tanks in Leeds for more than two decades and are regarded as leading players in our field. People purchase septic tanks for a host of reasons. Septic tanks are ideal for those in need of reliable and efficient methods for disposing of wastewater. When you use a septic tank, you don’t need to depend on public sewers and can process and recycle your wastewater in an environmentally-friendly manner. Some people opt for septic tanks because their homes are not connected to main sewage pipes, whilst others do so because they want to make a better contribution to the environment. Septic tanks are large containers stored underground that collect and treat wastewater from nearby properties. Natural biological processes are used to separate oils, solids, greases and water. Once the water has been clarified, it is sent into the drainage field, treated by bacteria in the soil and sent back into the environment. If you don’t have a septic tank or similar solution in place, wastewater and effluence can build up around your home or business premises. Not only is this hazardous, it can even be toxic. 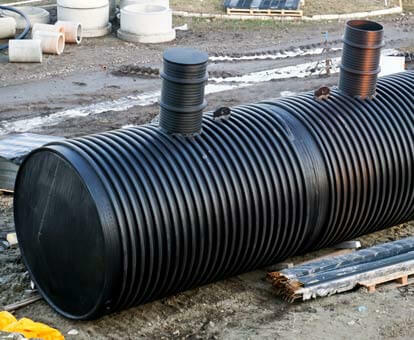 Many rural properties in parts of Leeds and West Yorkshire are not connected to main sewage lines, which is why there is such considerable demand for septic tanks and installation services in this area. Even if you are connected to the local sewage lines, you may still wish to purchase a septic tank, as it will help you become eco-friendlier and reduce the pressure placed on public sewage systems. Your tank will use a natural filtration system to recycle water using no chemicals. Opting for septic tank system can help you save money by removing the need to have a new pipe system installed. You won’t need to make any more regular payments to a sewage company, and you won’t need to carry out a great deal of maintenance. What’s more is that your septic tank can last for up to as much as 40 years once it is installed. In fact, some septic tanks last even longer than this. At OMDI, we offer bespoke septic tank designs to ensure that the specific needs of our customers in Leeds are always met. All our installations comply fully with relevant regulations, and we are able to count a wide range of business and residential clients amongst our customer network. We can also provide servicing and maintenance assistance to ensure your system continues to operate efficiently in the future. We are waiting to hear from you right now if you do require septic tank installation services in Leeds. You can reach us today by calling 01977 800 418 or by completing the contact form on our website. Alternatively, send an email to enquiries@omdi.co.uk. – the family-run drainage business with over 20 years experience providing a full turnkey solution.